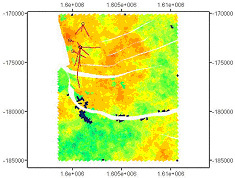 Earth Decision Sciences chooses INT GeoToolkit to develop 2D geologic interpretation modules. Earth Decision Sciences was looking for a solution to quickly develop a suite of 2D tools for interpretation, display, and QC of geologic data in single well views, multi-well cross sections, and maps. The new software would let customers perform rapid and accurate interpretation of geologic structure and stratigraphy with data ranging from regional geologic interpretations to detailed stratigraphic reservoir analyses. Important functionality included the ability to copy the interpretation results to a document and create scaled hardcopy CGM files. Earth Decision Sciences required a cross-platform solution based on C++, using Qt for the GUI environment. Target platforms were Solaris, SGI, Windows, and Linux. Earth Decision Sciences chose to base their new development on INT’s GeoToolkit C++ software components. The functionality offered in the toolkit, including seismic, log and contour displays, was a perfect match with the requirements for the new application. ESD did not have the resources to complete the project within the aggressive schedule; so to speed up delivery, they brought a developer from INT onboard. To maximize the contribution of INT’s developer, they defined a set of interfaces for the specialized graphic components. INT focused on developing the components while the EDS team focused on driving the components, including data access and the GUI. Earth Decision Sciences released a suite of 2D geologic interpretation modules, known as Views2D, and it quickly became an important and successful component of the Gocad Earth Modeling workflow. INT continues to collaborate with Earth Decision on new functionality for the Views2D modules. GeoToolkit proved to be a powerful and versatile development tool that shortened the development cycle for a complex and specialized application suite. 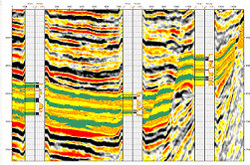 The project also provided INT with the opportunity to make significant enhancements to GeoToolkit, notably in the areas of deviated well display and support of complex fault systems. Earth Decision Sciences is a rapidly growing company focused on bringing GOCAD and related technologies to the oil and gas and mining industry and to the E&P software providers. From structural to reservoir modeling and risk analysis, Earth Decision Sciences provides an integrated, low cost suite of products on PC or UNIX platforms. © 2019 Interactive Network Technologies, Inc.